Avocados (Persea americana) are a fruit and not a vegetable. Avocado trees were first planted in Florida in 1833 and in California in 1856. Today, California is the U.S. leading producer of avocados, followed by Florida and Hawaii. 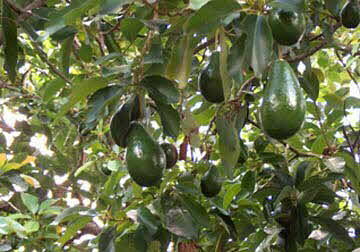 Total U.S. avocado production in 2011 was 226, 450 tons. Per person avocado consumption in the U.S. was 4.5 pounds in 2011. In 1989 it was only 1.1 pounds. Avocados have been cultivated in Central America for almost 7,000 years. They were first cultivated in South America with later migration to Mexico. It was believed that a Mayan princess ate the very first avocado and that it held mystical and magical powers. European sailors traveling to the New World used avocados as their form of butter. Avocados were first seen in the United States in the early 1800's. California is currently the largest producer of avocados stateside. There are more than 80 varieties, with the "Hass" variety dominating the crop share. A single mature avocado tree can produce more than 400 pieces of fruit in a year. About 50 million pounds of avocados are consumed in the U.S. on Super Bowl Sunday. According to EatingWell magazine, that is enough to cover an entire football field to a depth of nearly 12 feet. Spanish conquistadors discovered that avocado seeds yield a milky fluid that turns red when exposed to air. They used this indelible natural ink in documents that are preserved to this day. Avocados are about 22% fat, with the average medium size avocado containing 300 calories and 30 grams of fat. Avocados are members of the Laurel family which also includes the bay laurel and cinnamon tree. Avocados are a good source of both soluble and insoluble fiber. They are also a good first solid food for babies. Fallbrook, California is the Avocado Capital of the World. More avocados are grown there than any place else in the U.S. There are several varieties of avocados and each have a unique flavor and texture. FUERTE - This avocado is known for its thin smooth skin and creamy pale green flesh. The skin remains green when ripe. It is available late fall through spring. Considered a medium to large sized, pear shaped fruit. GWEN - Considered a Hass to some folks, but really is a different kind of avocado. With its medium to large oval shape and its thick pebbly green skin, this avocado's skin remains green when it's ripe. Gwen varieties are available late winter through late summer. HASS - The most common type of avocado in the United States is known for its purplish black pebbly skin. The skin darkens when the fruit is ripe and its flesh turns to a creamy pale green. This is the only year round avocado. PINKERTON - This variety looks like a long pear with pebbly green skin. The skin darkens when the fruit is ripe. The flesh is a creamy pale green with a small seed. This avocado is available winter through spring. REED - Also known as the Summertime variety avocado, it is a large round fruit with thick green slightly rough skin. The skin stays green and the flesh is a buttery yellow when the fruit is ripe. This fruit is only available in the summer and early fall. ZUTANO - Available fall through early winter, this avocado is characterized by its shiny, yellow green skin and pear shape. It is a large sized fruit that stays the same color when ripe and has pale green flesh."